in 1974 when large-scale U.S.
aid began, Israel had U.S.
about $40 million per plane. who are friends of Israel, and the Jewish people. and the Jewish people worldwide. Rabb' Ata"
at Calvary Temple, Assembly of God. $19 billion, the Premier said. see "eye to eye" on Lebanon. would and would not do. trade-off on the Syrian side,"
commissions (JNCs). by court level. Improvements in state office buildings. a *^ 5^'bansler of -. change, In rule, ind procedun?, ! medical maJpr.x-nce and seeks W ""
to vote inleltigenily The "
value ol money due to *""*,,. ILimpert to continue planning for the 1985 campaign. currently serves on its board. and Murray and Bea Kern. Jewry in Jerusalem in 1983.
the League of Women Voters. ur n, PaUen,S in h0SP**'s. for the past five years. SUNDAY MORNING, NOVEMBER 18,9:30 a.m.
an apology to the Jews. Isaac and Jacob in His Holy Word. ment with the Jewish people worldwide. in ihe past, we, like many "traditional Christians"
forgiveness for centuries of ignorance and arrogance. steadfast love GOD has for HIS beloved Israel. blessed to be in the family of GOD. Apodaca and Rabbi Joel (ha/in. evening is the result," he said. about Sukkot from the Jews." el for Miami and Puerto Rico. apology to the Jews. The Rev. bridges to peace in Israel." the Jewish Community Center's Camp Shalom. * L'CHAYIM Sunday, Oct. 21, 7:30 a.m.
SHALOM Sunday, Oct. 21, 10 a.m.
i-that landed on these shores. of the new found freedoms. banquet in the Soviet Union. the coming generation of U.S.
by Riverside in South Florida. according to the high standards demanded by Jewish tradition. through their association with Riverside Memorial Chapels. Sewn chapels in Dade, Broward and Palm Beach counties. Serving the New York Metropolitan area. hands in friendship, and bringing friends. benefit the Hadassah Medical Organization. formation call Ruth Siege! or Miriam Unger. and Greece where she met with the Jewish people. presented by Goldie Bernstein, Pauline Coler and Dr.
Education Day at Temple Beth Sholom. November. A week at the Regency Spa will be Nov. 4-11.
the Chase Federal Bank (Cross County Mall) at 12:30 p.m.
Bank, West Gate of Century Village. held on Monday, Oct. 22, at Temple Beth Shalom. Helen will play some solos. board member Sam Klein will read a Yiddish piece. Selma Kunin, co-chairman, will speak about ORT. Programs are on Tuesday and start at 10 a.m.
necessity for a serious partner. peace in the Middle East." The Council deals with local! achievement of modern architecture, a short walk from ancient history. Thai Cigarette Smoking Is Dangerous to Your Health. The house is filled with festive folk. All pews and aisle o'erflowing. The tumult's great and loud the noise. Against old men are crowding boys. They even swamp the east wall. Each chair and bench invading. With turbans, kerchiefs of all sorts. And Sabbath clothes parading . "Come, cantor, start," a voice rings clear. An apple red is gracing. And brother calls to sister. Are ringing and are jingling. The cantor struts, the cantor chants. The Torah with great longing. "God grant you life this coming year!" "Peace be with you, abundant cheer!" The maidens, too, are shouting. One talks, one sings, one shouts: "Please, hush!" Each count'nance beams with joyance. With all the crowd responding. Simchat Torah. By Jossi Stern. Color lithograph. Contemporary. Dr. E\erett Koop, the U.S.
dence of smoking in Israel. Discount Applies To Hotel Room Only. ot the Jewiah fnmm,,-;.., .j___u- _< ..
warenouse. through Fridays from 10 a.m.
long time volunteer at the Just browse. tickets call Sabina at 683-0852. Oct. 18th thru 24th. 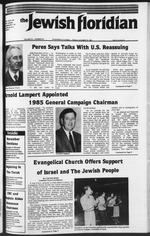 1984.
president of Temple Beth Fl. evening sen kes at the Temple. CONGREGATION ANSHEI SHOLOM 5346 Grov. 7:30 p.m.. Mincha followed by Sholoah Suedos. Speiser Daily Services 8:15 am. and 5:30 p.m.
Mondav and Thursday 9 a.m.
-aham. 3257 S E Salerno Road. Port Salerno. Abraham Rose. 1-2*7-8833 Services Friday e\ enmgs 8 p.m.
. -* 9 Friday night sendees S: 15 p m. Saturday. 9 a.m.
CONGREGATION BETH ISRAEL: 1592 Fkoraatt. P.O. Phua 222. US No 1. Teqnwta 33458 Phone 4 -> "
TEMPLE BETH EL: 4600 Oleander Avenue. FortPkn*.! Avenue and Victory Blvd.. Veto BeaehSZSW;. " Stephen Adams. Phone 1 5994180.
aach M-*-g addxnat PO Box i-0. A film "The New Library"
nary will also be shown. can go and seek assistance. P a gala brunch to follow. W Chpei, west Palm Beech.
" C".pei. west P.im Beach. Sholom, and Victor Duke co-chaired the tribute. LEWIS, VEQOSEN AND ROSENBACH, P.A. the temple on Sunday, Nov. 4.
tation will begin at 1:30 p.m.
also be part of the evening. Beers will do the narration. BECAUSE SO MUCH IS RIDING ON YOUR TIRES.